Tangerine is a member of the citrus family and closely resembles mandarin orange. It is small in size and tastes sweeter than oranges. Tangerine essential oil is extracted from its peel. The oil is orange-yellow in color and has a sweet orange fragrance. It is said to be therapeutic in that it fills you up with energy and zest. 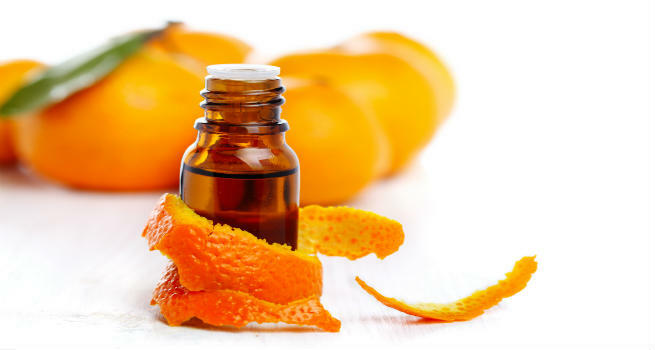 Let us see how to use Tangerine Essential oil for skin, hair and overall good health. Since it is extracted from the tangerine peel, the essential oil can be ingested. Mix one drop in 4 drops of coconut or olive oil, put it in a capsule and swallow it with some water. You can even add a drop of the essential oil in your water bottle to reap its benefits all through the day when you sip on the water. Tangerine Essential Oil is said to be energizing. So add a few drops in your massage oil or bath water and be filler with vigor. You can even add some to a vaporizer to uplift the mood around your home. The oil is known as a happy oil. Smelling its fragrance will surely be invigorating. The essential oil from tangerines finds its way in many products that help treat stretch marks. Its chemical composition is known to help with circulation, reduce cellulite and erase stretch marks. Use a few drops in your massage oil to get maximum benefits. It is known for its ability to moisturize the skin and keep it supple. Use it in combination with a light oil like jojoba or coconut oil and massage your skin well with it. The ratio for skin massage is 1 drop of essential oil per 5 ml of carrier oil. Tangerine oil is antiseptic and improves circulation, making it an ideal choice to treat acne. Topically applying it with grapeseed oil in a 1:4 mixture on acne is said to control acne. Since the essential oil is antiseptic, adding 2-3 drops to your hair massage oil will help you control any scalp infections. Massage your hair with this oil and leave it on for an hour before shampooing it for best results. If you suffer from hair loss, then mix together 2 drops of tangerine essential oil with sweet almond oil or coconut oil and massage your roots with it every night. This will help improve circulation and rejuvenate your roots leading to bouncy hair. It is anti-spasmodic- it relaxes the muscles and nerves and prevents spasms from occurring. Not just that, tangerine essential oil also is a depurative – it purifies blood. It helps in expelling toxins from the body through urine, excretion and sweat. To get the benefits of tangerine essential oil, mix one drop in four drops of edible oil and consume or add a drop of it in your drinking water bottle and sip through the day.